We’d love your help. Let us know what’s wrong with this preview of The Gardens of Democracy by Eric Liu. Understand income inequality, middle-out economics and other realities of modern America as authors Eric Liu and Nick Hanauer argue that fundamental American assumptions about citizenship, society, economics, and government need updating for the 21st century. For many years the dominant metaphor for understanding markets and government has been the machine. Liu and Hanauer Understand income inequality, middle-out economics and other realities of modern America as authors Eric Liu and Nick Hanauer argue that fundamental American assumptions about citizenship, society, economics, and government need updating for the 21st century. To ask other readers questions about The Gardens of Democracy, please sign up. This was a thoughtful but flawed book. The authors argue--compellingly--that rather than using the metaphor of a machine for the economy, and for democracy, we are better served by thinking of it as a garden. I like that idea, and found it to be a useful frame for considering the modern nation in which we live. Transparency and clear rules are the soil, for instance. Education, infrastructure, health and healthcare, a social safety net, are the fertilizer. Rather than planting a monoculture (Too This was a thoughtful but flawed book. The authors argue--compellingly--that rather than using the metaphor of a machine for the economy, and for democracy, we are better served by thinking of it as a garden. I like that idea, and found it to be a useful frame for considering the modern nation in which we live. Transparency and clear rules are the soil, for instance. Education, infrastructure, health and healthcare, a social safety net, are the fertilizer. Rather than planting a monoculture (Too Big To Fail institutions, large monopolistic corporations) we should have a diversity of mostly local businesses that can compete, just as plants do in nature. Citizens, and the goverment of the People, should be gardeners, tending what grows in the healthy soil of our nation's civil and economic garden. Lovely. The author's lost me, though, with their loving, unrealistic, fantasy vision of a large federal government that sets national goals then lets smaller entities--states, cities, municipal organizations, non-profits, civic organizations, etc. reach those goals without interference. It's just not something that is feasible in our current political culture. It's a nice idea; don't get me wrong. I don't disagree in the least. I just don't think it's possible anymore. The Progressives want top down control coming from Washington, and the Right wants corporatocracy. There is no middle to which thoughtful, intelligent people like these two authors can appeal. Maybe someday, but not now. So I enjoyed this book in the same way I enjoy reading books about world peace: great idea. Good luck with that. Update: April 2016. In observing this most recent Presidential election cycle, I am reached the inescapable conclusion that our system is broken beyond repair. Unless the radical ideas like those found in this book are enacted, we are going to lose even the appearance of democracy. Our system is no longer functioning, and we need to do something different--NOW--or we are all fucked. We are an oligarchy and a corporatocracy, not a republic. There are two parties, the party of Wall Street, and the party of (slightly less) Wall Street. Our society, and our culture, have to evolve to face the realities of the 21st century, or we are going to collapse into waring tribes, feudalism, and chaos. I have read a book that proposes that this is the greater part of our problem: Government as usual. 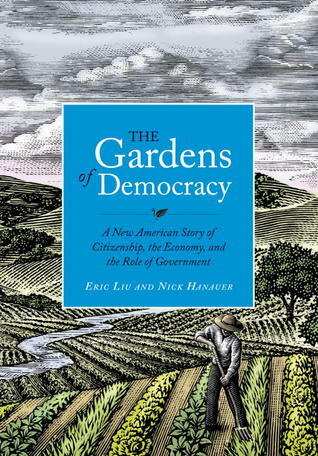 The book is The Gardens of Democracy: A New American Story of Citizenship, the Economy, and the Role of Government by Eric Liu and Nick Hanauer. Many of the reviews I’ve read have mentioned have said that this is a short book, which it is. It could have been much longer and I would have continued reading, I found the ideas and proposals of the authors so relevant and hopeful for our nation. The authors propose that our usual way of looking at the world, democracy, and the economy is dictated by “machinebrain” and is predicated upon stability, predictability, and self-correction. A new, more effective way would be to picture a garden, which needs to be planned, tended, and changed as conditions demand. And we are all the gardeners. True self-interest is mutual interest. Society becomes how you behave. Within these principles, the authors address many of the ideas, concerns and fears that are the focus of the presidential campaigns. Fortunately, their approach is much less biased than what we are hearing from the parties involved in the election. That gives me hope. In the meantime, I suggest you read this short book. It will take less time than many of the things you’ve already read, or posted, or reposted, or “liked”, or argued against. And it might just give us all a place to begin after the election. A concise and intelligent book I expect I will return to again and again. The authors make the case for changing our mode of thinking of government as a machine that self-corrects and achieves equilibrium when everyone is pursuing their own self-interest, to thinking of government as a garden, where there is conscious cultivation in order to promote the health and wealth of all. A great case for nonpartisan civic engagement and a clear, thoughtful refutation of free-market economics. I hope this A concise and intelligent book I expect I will return to again and again. The authors make the case for changing our mode of thinking of government as a machine that self-corrects and achieves equilibrium when everyone is pursuing their own self-interest, to thinking of government as a garden, where there is conscious cultivation in order to promote the health and wealth of all. A great case for nonpartisan civic engagement and a clear, thoughtful refutation of free-market economics. Gardens of democracy is a great evaluation of what's currently wrong with the concept of American citizenship on both the left and right. They point out that our political system is based on Enlightenment scientific ideals like linearity and predictability, but we science now tells us that our highly networked, independent, and non-linear society can't be described by those old assumptions and theories. Liu and Hanauer advocate for a much more pragmatic approach to politics and the rebirth of loc Gardens of democracy is a great evaluation of what's currently wrong with the concept of American citizenship on both the left and right. They point out that our political system is based on Enlightenment scientific ideals like linearity and predictability, but we science now tells us that our highly networked, independent, and non-linear society can't be described by those old assumptions and theories. The basic premise of this book -- that democracy requires active care and involved citizens -- is clear by the end of the book. The book is too short, though, and left me feeling unsatisfied. I finished this a week ago and can't really remember much else besides the basic premise because there wasn't enough examples or discussion for the subsidiary points. I saw a Nick Hanauer TED Talk ( https://www.ted.com/talks/nick_hanaue... ), and when I found out he had a book, of course I was interested... especially with "Garden" in the title. Well, I really got more than I bargained for, not only was the book by NH and based loosely on gardening, with organic principles of ecology woven in, it also references physics, complexity and emergence. What an unexpected confluence of topics that I am interested in! Basically, the idea that the oversimplified math I saw a Nick Hanauer TED Talk ( https://www.ted.com/talks/nick_hanaue... ), and when I found out he had a book, of course I was interested... especially with "Garden" in the title. It's hard to give this book a single rating... my reaction to it is kind of all over the map. With some parts I agreed, with some parts I (strongly) disagreed, and some parts I just couldn't tell where the authors were coming from or what they were saying. However, this book is interesting and thought-provoking, and the authors acknowledge differing opinions and even encourage the reader to come up with their own ideas about American citizenship, economy, and government. The authors' argument is It's hard to give this book a single rating... my reaction to it is kind of all over the map. With some parts I agreed, with some parts I (strongly) disagreed, and some parts I just couldn't tell where the authors were coming from or what they were saying. However, this book is interesting and thought-provoking, and the authors acknowledge differing opinions and even encourage the reader to come up with their own ideas about American citizenship, economy, and government. The authors' argument is that we need to throw away our existing ideas and metaphors about how people and our government should behave and start fresh with things that we know work today and a new metaphor for American government: as a garden instead of a machine. What the difference is between those, I'm still not entirely clear and don't agree with their definitions. Nor am I convinced the authors are clear in their own minds exactly what the difference is. In their push to transcend the machine metaphor, they drastically over-simplify some current ideas and set up straw men to knock down. They also use the new metaphor to argue for some current liberal issues that strike me as doing exactly the opposite of transcending to the new metaphor. However, as someone who has tried to think of drastic changes we could make to have government work better, I have come to agree with the authors that a new way of thinking is necessary and a new metaphor would be helpful. It should be noted that the authors are very liberal and even staunchly Democrat in their ideology. Although they claim to have transcended the conflict between Democrat and Republican, they significantly distort Republican ideals and ascribe greed and idiocy as the reasons for holding them. They say that Democrat ideals are also wrong, but excuse many of them because the holders of those ideas had good motives and the ideals are just outdated as opposed to antithetical to human existence. The reason I bring this up is that, in many cases, the authors actually agree with conservatives about some ideals and how certain things should be done. They've pushed conservatives further to the right in order to claim some of that ground, and in one case they actually apologize to liberals for agreeing with a common conservative criticism of liberal ideas. In other cases they describe their opinion in a roundabout way, obfuscating the fact that they are long-held conservative values. Clearly they have not managed to transcend the conflict themselves, and to someone in the middle it gets in the way of clearly communicating their ideas. Gardens of Democracy gets a 5 star rating from me for its creativity, originality, and thoughtfulness in busting through the conventional wisdom of our stale left vs. right debate over the role of government. The book is quite lean which makes it less comprehensive than it could be. For example, some of the book's conclusions are based on what the authors claim are the fresh insights of a "new scientific revolution" that is apparently changing the way we think about the nature of humans, society, Gardens of Democracy gets a 5 star rating from me for its creativity, originality, and thoughtfulness in busting through the conventional wisdom of our stale left vs. right debate over the role of government. The book is quite lean which makes it less comprehensive than it could be. For example, some of the book's conclusions are based on what the authors claim are the fresh insights of a "new scientific revolution" that is apparently changing the way we think about the nature of humans, society, and the economy. That claim is made without much solid support in the book, but that's not really the point. The authors provide a reading list at the end for anyone who is interested in digging more deeply. The sacrifice of thoroughness is well worth it for what the authors gain in terms of readability, clarity, and elegance of their argument. I have read many, many books on politics and the economy in recent years and Gardens of Democracy is by far the most memorable. The authors shake up our stale debate by challenging the basic assumptions of our political ideologies and the basic metaphors we use to talk about citizens, the economy, and society. I loved the image of society/the economy as a garden. Tending is what separates a garden from the wild and without intentional seeding and care, weeds will grow and overtake what makes the garden beautiful and productive. It's such a useful and powerful metaphor and a welcome relief to the "machine brain" view that currently underlies our political debate. I give the book 5 stars for its originality and for how thought-provoking it is, however I didn't agree with every point. I found their arguments on citizenship and the economy to be thoroughly convincing, however, I found myself skeptical of some of their "solutions" for how government should change and adapt. For example, they attack "big government" liberalism that is big on setting national goals (the Big What - which they say is good) and big on determining how those goals should be met (the Big How - which they criticize). While the authors convincingly cited the experience of other nations in discrediting the "libertarian fantasy" approach to governing, they never provide any evidence that their proposed solution (Big What, Small How) has ever worked anywhere else, or would be effective. They also attack the bigness of our federal government and its role as a service provider without much support. They hold up some european countries with regulatory states as big successes, but they fail to realize many of these governments are the kind of "Big What, Big How" governments that they later criticize. Very interesting book. Highly recommended to every body. It is short and accessible, but contains some very powerful ideas. I love the idea of society as a garden that needs tending, not as a machine that should be left to run of its own accord. Much of our current political and economic theory is based in 19th and 20th century Newtonian/deterministic science and philosophy. Well, our science has moved on, and we now know the world is much more complex, and inherently unpredictable (in some rega Very interesting book. Highly recommended to every body. It is short and accessible, but contains some very powerful ideas. I love the idea of society as a garden that needs tending, not as a machine that should be left to run of its own accord. Much of our current political and economic theory is based in 19th and 20th century Newtonian/deterministic science and philosophy. Well, our science has moved on, and we now know the world is much more complex, and inherently unpredictable (in some regards more than others), but our political philosophy is rooted in the old ways of thinking. I agree with the book, we need a new way to look at the world, a systems based approach, which factors in chaos and complexity and feedback loops. This book largely reiterates the point it began with - We're all better off when we're all better off. Two points which make this book an interesting one are the argument that Wealth is not individuals accumulating money but Wealth is society creating solutions. Another interesting argument is it emphasize how ill suited the conservative, libertarian & liberal views of governance are which were models created in a time where change happened incrementally. In a world where changes happen befo This book largely reiterates the point it began with - We're all better off when we're all better off. Two points which make this book an interesting one are the argument that Wealth is not individuals accumulating money but Wealth is society creating solutions. Another interesting argument is it emphasize how ill suited the conservative, libertarian & liberal views of governance are which were models created in a time where change happened incrementally. In a world where changes happen before one can understand the ramifications of the previous change, the gardenbrain approach to governance & economy is better suited than the machinebrain approach. Gardens of Democracy provides a digestible overview of topics often too hard to even chew on. The clarity of writing i s matched in the small pages, large font, and approachable look and feel of the cover and layout. I never thought such heavy content could be such an easy read, but these guys achieved it! As an author myself writing about emotional healing as an aspect of societal healing, this book provides a great basic framework to illustrate where our society is stuck and where we need to go Gardens of Democracy provides a digestible overview of topics often too hard to even chew on. The clarity of writing i s matched in the small pages, large font, and approachable look and feel of the cover and layout. I never thought such heavy content could be such an easy read, but these guys achieved it! This is a thoughtful little book, and I wish every American would read it. It has made think a lot about my role as a citizen and as part of a community. The authors' argument that true self-interest is mutual interest (we're all better off when we're all better off) makes a lot of sense to me. And I think that if these ideas were actually applied to personal behavior and to policy, America would be a better, stronger country. GoD is a vast improvement on their previous work, True Patriot. However it still lacks supporting evidence and is far too left focused to appeal to conservatives. the authors also lump libertarianism in to conservatives which is a shame because what it is really describing is progressive/social libertarianism. Other than that, the authors lay out a very nice hypothesis as to future trends in politics. despite its problems, I would still consider it a must read for political thinkers. What a quirky, awesome little book! Liu and Hanauer reframe democracy as a garden, not a machine (parallel to much of our Honeybee work, trying to reframe investing as a natural system, not an engineered one). “True self interest is mutual interest”! And their list of inspiring books is, well, inspiring. A short book full of big ideas that articulated what I've been feeling - the need for an engaged citizenship and roles for government and capitalism that assume we're all better off when we're all better off. The old perception of the economy being like a machine when it's really more like a garden that needs to be tended resonated with me. I read it twice - thought provoking! Charting a course between Traditional Left and Traditional Right, Liu and Hanauer try to assert the need for a rejuvenated American political system. They're capitalists, so it's not "BURN THE RICH FOR HEAT", but they believe in a strong role for the state. I think they fall down where most non-politicians fall down: it's easy to say, in generalities, what should happen, but the problem with politics is that specifics of implementation are where things go wrong. After all, the current American s Charting a course between Traditional Left and Traditional Right, Liu and Hanauer try to assert the need for a rejuvenated American political system. They're capitalists, so it's not "BURN THE RICH FOR HEAT", but they believe in a strong role for the state. I think they fall down where most non-politicians fall down: it's easy to say, in generalities, what should happen, but the problem with politics is that specifics of implementation are where things go wrong. After all, the current American system can be described as sounding perfect but it's the details of the implementation that let it down. Their vague recommendations: "Maximize the number of able, diverse competitors", "Break up opportunity monopolies", "Concentrations of poverty follow concentrations of wealth", Promote true competition. In American policy today, we don’t help people become rich; we reward the already rich for being rich", "Harness market forces to national goal", etc. The thesis is that the economy is a garden, not a machine or an ecosystem. Things are never "in balance" for long, they're constantly changing. Gardens require gardeners to create the environment for desired activities and suppress undesired ones. The goal is to create a strong middle-class, because that's who spends money to support thriving industries and businesses. They want the economy to "grow from the middle out", summed up in the brilliantly-phrased "we are all better off when we are all better off. But there's lots of good that I did take. Assembled quotes below. The words enshrined in the Jefferson Memorial, written 40 years after the Declaration and 43 years before Darwin authored Origin of Species, capture this spirit perfectly: I am not an advocate for frequent changes in laws and constitutions. But laws and institutions must go hand in hand with the progress of the human mind. As that becomes more developed, more enlightened, as new discoveries are made, new truths discovered and manners and opinions change, with the change of circumstances, institutions must advance also to keep pace with the times. We might as well require a man to wear still the coat which fitted him when a boy as civilized society to remain ever under the regimen of their barbarous ancestors. True citizenship is about treating even the most trivial choice as a chance to shape your society and be a leader. It is laying down habits that scale up throughout society. It is not just setting an example; it is actively leading others to copy you. If we look at good citizenship as a contagion, but as a contagion we want to accelerate rather than contain, then it behooves us to search out the supercarriers—the nodes of networks in every community whose influence and reach are disproportionate. In every latticework, whether chemical or physical or human, it’s the links that connect a tight ring to another tight ring that add the greatest collective value and make the network bigger and more powerful. Or to put it in terms used by Robert Putnam, bridging social capital is better than bonding. As a matter of both public policy and private self-organization, we should be de-chunking ourselves into units of no more than 150, and then connecting the chunks. Courtesy—a cooperative consideration of, and deferral to, the needs of others—is the start of true citizenship. Designing experiences where people come to know each other, where they can expect to encounter one another repeatedly, and where the quality of life is increased for all if each individual thinks of himself as a steward—or trustee—of the experience. Within any given competitive environment—or what’s called a “fitness landscape”—individuals and groups cooperate to compete, to find solutions to problems and share the gains from those solutions. The most successful strategies for cooperation spread and multiply. Throughout, minor initial advantages get amplified and locked in—as do disadvantages. Whether you are predator or prey, spore or seed, the opportunity to thrive compounds and then concentrates. It bunches. It never stays evenly spread. if markets are perfectly efficient then it must be true that: –The market is always right. –Markets distribute goods, services, and benefits rationally and efficiently. –Market outcomes are inherently moral because they perfectly reflect talent and merit and so the rich deserve to be rich and the poor deserve to be poor. –Any attempt to control market outcomes is inefficient and thus immoral. –Any non-market activity is inherently suboptimal. –If you can make money doing something not illegal, you should do it. -As long as there is a willing buyer and seller, every transaction is moral. -Any government solution, absent a total market failure, is a bad solution. As complex adaptive systems, markets are not like machines at all but like gardens. This means, then, that the following must be true: –The market is often wrong. –Markets distribute goods, services, and benefits in ways that often are irrational, semi-blind, and overdependent on chance. –Market outcomes are not necessarily moral—and are sometimes immoral—because they reflect a dynamic blend of earned merit and the very unearned compounding of early advantage or disadvantage. –If well-tended, markets produce great results but if untended, they destroy themselves. –Markets, like gardens, require constant seeding, feeding, and weeding by government and citizens. –More, they require judgments about what kind of growth is beneficial. Just because dandelions, like hedge funds, grow easily and quickly, doesn’t mean we should let them take over. Just because you can make money doing something doesn’t mean it is good for the society. –In a democracy we have not only the ability but also the essential obligation to shape markets—through moral choices and government action—to create outcomes good for our communities. As we write, the Chinese government is making massive, determined, strategic investments in their renewable energy industry. They’ve decided that it’s better for the world’s largest population and second-largest economy to be green than not—and they are shaping the market with that goal in mind. By doing so they both reduce global warming and secure economic advantage in the future. We are captive, meanwhile, to market fundamentalism that calls into question the right of government to act at all—thus ceding strategic advantage to our most serious global rival and putting America in a position to be poorer, weaker, and dirtier down the road. This is not picking winners; it’s picking games. [...] To refuse to make such game-level choices is to refuse to have a strategy, and is as dangerous in economic life as it would be in military operations. Trust creates cooperation, and cooperation is what creates win-win outcomes. High-trust networks thrive; low-trust ones fail. And when greed and self-interest are glorified above all, high-trust networks become low-trust. The election of Ronald Reagan in 1980, under the banner of “limited government” and “trickle-down economics,” marked the start of a Thirty Years War against the middle class. In their paper, Kumhof and Rancière demonstrated that inequality and financial leverage create an unholy and fatal feedback loop. As the wealthy accumulate ever more money they generate price bubbles in real estate and other assets, which force all other participants in the economy to borrow more just to keep up. As the wealthy accumulate capital, their need to find return for these assets grows. The rich come to financialize their assets in the form of loans to—whom else?—the poor and middle class. Easy credit is the natural result of enormous pools of money seeking returns. As the poor and middle class borrow more in order to maintain lifestyles increasingly beyond their means, unsustainable leverage follows. In both 1929 and 2008, collapse was the inevitable consequence. whereas wages used to track productivity, they no longer do: American workers are ever more productive, but the wealthy are capturing those gains. [...] If the income distribution for all Americans had remained constant since 1980, the average American family would be earning $64,395, which is $12,295 and 24 percent more than they do today. (And while we don’t advocate the 90 percent marginal rate of the 1960s, we would note that America’s growth rates were never higher than during that period of supposedly job-killing high taxes). this agenda—as exemplified by the Reagan rewrite of the tax code and the Bush perpetuation of it—is itself government-mandated redistribution of wealth: to the already wealthy. The “state of nature” does not dictate preferential treatment of capital over work, or regressivity of taxation, or the tax-free inheritance of unearned wealth and power: these are all consequences of man-made rules. The question, then, is not whether redistribution but in which direction. Today the richest 1 percent of Americans has more wealth than the bottom 90 percent. The richest 1 percent collects twice as much annual income as the lower 50 percent. That is not circulation; it is clumping and clotting. Economic right-wingers insist that heroic individuals “do it themselves” and that such people are “self-made.” This claim does not hold up under any serious scrutiny. Ford could not have created an auto industry without the roads necessary for them to travel on. He did not build those roads, let alone mark or map them. Amazon and Google did not create the Internet; the federal government did. No company in America has provided the infrastructure that made its lines of businesses possible, much less educated its own workforce. As James Scott describes in Seeing Like a State, his illuminating survey of social engineering schemes of the 20th century, the very idea of “social engineering” treats complex human problems as orderly, predictable, manageable. The trouble, of course, is that they are not. This desire to “bracket uncertainty,” as Scott writes, is self-defeating in three ways: sclerosis, impracticality, and crowding out. Progressives say “it takes a village,” but then too often rely on an agency. We do not accept a false choice between individual rights and collective responsibility. We say you can have both. You can’t have either unless you have both. And to win, you must have both. With inalienable rights come inalienable responsibilities. Freedom is just another word for we’re all in it together. What an essential and aspirational book! This should be required reading for all Americans, and unfortunately for our nation, it won’t be. Written in 2011, still totally fresh and valid in 2018, and only more imperative. Aiming for so much in just 165 small and easy pages: to heal the political divide that is poisoning our democracy. Who expected Russia to so effectively undermine it over these 7 years. I’m sad that this valuable viewpoint hasn’t had much more attention. The book includes many dee What an essential and aspirational book! This should be required reading for all Americans, and unfortunately for our nation, it won’t be. The book includes many deep and effective references to important political, sociological and philosophical books, so I found many pointer to further reading. Society because how ‘you’ behave. we are all better off, if we are all better off! greed is both immoral and ineffective. Government needs to be Big in What, and Small in How. Co-written by an ex-presidential speech writer (Liu) and a dot.com billionaire (Hanauer), Gardens of Democracy lays out their plan for a new, or revised, form of American democracy, that promises to solve the crises that now face the United States, if not the world at large. Hanauer and Liu argue that the system of government as it has devolved in the U.S., has allowed the upper 1% to accrue the lion’s share of wealth, while gutting the middle class to the point of extinction. This, they argue, Co-written by an ex-presidential speech writer (Liu) and a dot.com billionaire (Hanauer), Gardens of Democracy lays out their plan for a new, or revised, form of American democracy, that promises to solve the crises that now face the United States, if not the world at large. Hanauer and Liu argue that the system of government as it has devolved in the U.S., has allowed the upper 1% to accrue the lion’s share of wealth, while gutting the middle class to the point of extinction. This, they argue, is not only morally wrong, but fiscally stupid. They contend, correctly, that wealth does not evolve from the top and trickle down (as so many still think), but rather is created in the middle class, and trickles upward. The current economic mode of thought is rooted in the industrial revolution: a philosophy that the authors call ‘machine brain’. They define this as a tendency to see things in a linear, input/output way. People, economies and systems work like machines. This is obviously wrong, Hanauer and Liu argue. Consumers make choices, mostly based on emotions, wants and desires. One cannot accurately predict what they will want, or do in any given moment. Liu and Hanauer argue that instead of machine brain, we should think more on the lines of ‘garden brain.’ Instead of treating economies and government like machines, we should think of them as gardens. Gardens cannot be wholly predicted. A gardener can plant seeds, but not predict the outcome. He may, however, weed the garden, water it, and tend it. To let it go, laissez faire, would be to invite weeds to take over. This is what has led to the imbalance of wealth in modern capitalism, according to the authors. The authors contend that it is the role of good government, or good gardening, to recirculate (not redistribute or ‘spend’) wealth, from those that have benefitted most from the infrastructure and security that government affords, back into the system to reinvest it in more and better infrastructure that benefits all citizens, starting with the middle class. This, they argue, will benefit not only those at the bottom of the economic ladder, but put wealth back into the hands of a strengthened middle class, who will in turn spend it, fueling the economy which benefits the wealthy as well. They vigorously attack Libertarian ideals that ‘any government’ is too much government, or the idea that all forms of governing are somehow tantamount to communism. They take on the Republicans, who have co-opted much of the Libertarian mentality, as well as the Democrats who have on the one hand argued for more government involvement, but made little changes—even when they had the chance—to the underlying assumptions about how capitalism is supposed to work, i.e., they basically buy into the machine brain mentality. The authors argue that good democratic government can be big on the WHAT—in other words, set out a theory of what government should do, and the goals that the nation, state, or municipality, should aim for (something that the Democrats might agree to)—but small on the HOW to accomplish those things—not micromanaging from the center, or top, but giving power to the local governments to adapt resources to their particular situations—something that Republicans argue for. The authors acknowledge that in order to accomplish all these changes, major issues of corruption in government must be dealt with. The problem is that their solutions to this problem, while great in theory—they do a damned good job of laying out the issues—are blocked by the very corruption they set out to solve. How does one push through major changes to government, changes that would eliminate corruption, when you need the corrupt institution to make the changes? It’s a Catch 22, and I suspect that Hanauer and Liu know this. I also suspect that they know what must really happen in order to clean up the corruption at the highest levels, since it is corporate money fueling it, but that since Hanauer himself, is a product of corporate money, and a believer in the American Economy, is loathe to articulate it. Instead, Hanauer and Liu’s book seems to be an appeal to the one-percenters to ‘lay off,’ so to speak, and to start thinking about government and taxes as a way to refuel an economy that is dying, something that will not benefit them in the end. The radical nature of their argument isn’t so much in the actual ideas put forward, which are reasonable, sound and logical. What’s radical, is who is writing it, especially Hanauer, who is firmly in the top .01% of the billionaire club! He is an insider to a world that most of us simply cannot imagine. But he has an unusual interest in history, for one so privileged, and as such, can read the writing on the wall if things remain the same. His insider perspective is refreshing. If you want to know more about his position on issues, I would suggest reading his article, “The Pitchforks are Coming,” online HERE. It’s an eye-opener for sure, and the reason I stumbled onto his book in the first place. Great book if you’re interested in becoming an elected official, or you’re Pierre Trudeau who is reading it, apparently. But I just can’t deal with this stuff anymore. I’m too old, too tired, too sick of my relatives saying the stupidest things and trying to combat that. The world will be the world and I’m not making a difference and I know that. A brief survey of much of the current thinking on complexity thinking and how it applies to the social sciences. As such, this was familiar ground for me, though it was good to get it in an easy to read format with a good central metaphor. What I really appreciate from this is the list of references, It put a lot of new books on my hit list. I could try to break down my feelings about this book, but to sum it is I'll just ask: ever agree with most of what a person said but you still want to throttle them because the message was delivered in a way that was both smug and obnoxious? We're all better off when we're all better off. Democracy is all about including all voices, not just the elites of society. Another book in the required reading category! Refreshing and clever book that expresses all that I've intuited about being an engaged citizen in our great nation! "The failure of American politics to address and solve the great challenges of our time--climate change, debt and deficits, worsening schools, rising health care costs, the shriveling of the middle class--is not just a failure of will or nerve. It is equally a failure of ideas and understanding. And the failure to address these challen Another book in the required reading category! Refreshing and clever book that expresses all that I've intuited about being an engaged citizen in our great nation! "The failure of American politics to address and solve the great challenges of our time--climate change, debt and deficits, worsening schools, rising health care costs, the shriveling of the middle class--is not just a failure of will or nerve. It is equally a failure of ideas and understanding. And the failure to address these challenges isn't just a matter of politics, but of survival." "To be a gardener is not to let nature take its course; it is to tend. It is to accept responsibility for nurturing the good growth and killing the bad." "New understanding turns simple observation into meaningful perception." "Reciprocity makes compassion not a form of weakness but a model of strength; it makes pro-social morality not just moral but natural and smart." "Competition properly understood--in nature or in business--is between groups of cooperators." "Where the rationalist schemes of central planners on the left and market fundamentalists on the right have led to costly hubris, public policy informed by the new science should now lead to constant humility." "It is an accepted axiom of corporate life that great companies create a culture where any problem the company faces is every employee's problem." "Citizenship matters because it delivers for society what neither the market nor the state can or should." "Citizenship is a recognition that we are interdependent--that there are values, systems, and skills that hold us together as social animals, particularly in a tolerant, multi-ethic market democracy." "True citizenship is about treating even the most trivial choice as a chance to shape your society and be a leader." "Courtesy--a cooperative consideration of, and deferral to, the needs of others--is the start of true citizenship." "Cooperation presumes difference--and derives its moral value from the fact that joint action is undertaken out of difference rather than out of sameness." "To assume that society becomes how you behave is to take on the responsibility of everyday 'small' leadership. This is more than acknowledging that on an individual basis, character counts and virtue matters. It's acting as if the character of a community will, sooner or later, exactly reflect your own character: because it will. Collective character is real and something each of us shapes." "Because participation, freely chosen rather than incentivized or delegated, springs from intrinsic motivation--and intrinsic motivation yields the kind of happiness that money can't buy and laws can't create." "Markets are meant to be servants, not masters." "In this Gardenbrain sense, government does not spend money; it circulates it. It does not redistribute money; it recirculates it." "Government doesn't spend money like it's a perishable or a consumable good. Government circulates money, and the flow, direction, and pace that circulation are determined by policies our elected leaders choose." "Diversity is not only nice and inclusive; it is smart and effective." "'Free enterprise' assumes there is such a thing as an individual separate from the community, when in fact, an individual's ability to pursue life, liberty, and property--to live up to his or her full potential--is realized only in community. Markets themselves exist only as social institutions, with rules made by people not by nature or deities." "The reality is that when not only goals but also means are determined at the center, government is always a step behind reality." "When Americans come to think of government as a vending machine--drop in the coins and expect a great society to come out--then good citizenship shrivels." "Trust is the most precious form of capital, generating prosperity and security." I came across this book when I saw a TV interview with Nick Hanauer, in which he -- as an entrepreneur and affirmed capitalist -- raised a point that we don't often see acknowledged: that the "capitalist" system we have, in which "rational self-interest" is meant to guide society by way of the efficient markets hypothesis, is fundamentally broken. That piqued my interest, as it's not often you come across a beneficiary of a system levelling any form of criticism at it (self-interest at work agai I came across this book when I saw a TV interview with Nick Hanauer, in which he -- as an entrepreneur and affirmed capitalist -- raised a point that we don't often see acknowledged: that the "capitalist" system we have, in which "rational self-interest" is meant to guide society by way of the efficient markets hypothesis, is fundamentally broken. That piqued my interest, as it's not often you come across a beneficiary of a system levelling any form of criticism at it (self-interest at work again). For a little book, they Hanauer and co-author Eric Liu tackle an enormous subject and do it well. The current system, which praises the self-regulating market and the self-interested behavior meant to create it, is broken, they say, rooted in outdated 19th century notions of human behavior and large systems alike. The reductionist, atomistic belief in society as a Victorian clockwork and the human being as a rational, selfish decision-maker -- a perspective they call the Machinebrain -- both come under fire. As an alternative, they offer the Gardenbrain, and it's here that they really caught my attention. Mechanistic thinking has given way to a more subtle view in recent decades. Economies aren't self-correcting machines, but rather a type of phenomenon called a complex adaptive system. Economies are networks, and networks have emergent properties which aren't immediately evident by looking at the component pieces. Humans, too, are more than rational calculators; an array of research shows that, while we do have a selfish streak, we're also what they call emotional reciprocal approximators -- not quite irrational, but biased by our emotions and asymmetric in our preferences. With a new set of building blocks, Hanauer and Liu set out to dismantle many of the long-cherished beliefs held by both Right and Left, creating new proposals for individual citizenship, economic growth, and government policy following from their concept of the Gardenbrain. Society needs tending and oversight at all levels, not the market free-for-all of the Right or the statist bureaucracies of the Left. We need to be good citizens and realize that our "not my problem" self-interested view of the world has consequences. We need to be Gardeners rather than viewing our world as mechanistic systems that work independently of our actions. A brief and inspiring proposal for a new kind of polity in America. I don't hold out much hope for it coming to pass, because all Republicans, most Democrats, and their paymasters at Goldman Sachs have no interest in seeing it happen. Most interesting was the way it posited a systems-theory "Gardenbrain" as the (new) appropriate representation of the way the world works, as opposed to the reductionist and mechanistic "Machinebrain" model which seemed to explain things for so long, and which both A brief and inspiring proposal for a new kind of polity in America. I don't hold out much hope for it coming to pass, because all Republicans, most Democrats, and their paymasters at Goldman Sachs have no interest in seeing it happen. Most interesting was the way it posited a systems-theory "Gardenbrain" as the (new) appropriate representation of the way the world works, as opposed to the reductionist and mechanistic "Machinebrain" model which seemed to explain things for so long, and which both major parties are still completely beholden to. That's the kind of thing I was getting from the Whole Systems Design program at Antioch 13+ years ago; it's great to see it here, but has it really taken that long to filter into even this tiny little tributary of the public debate? The authors' takedown of libertarianism is entertaining: "Libertarianism is Machinebrain thinking at its worst. It rests on a linear understanding of social and economic systems and on the falsehood that humans are reliably and inherently rational, calculating, and selfish."